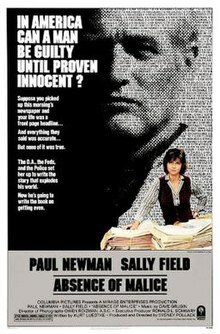 Absence of Malice is a 1981 American drama film starring Paul Newman, Sally Field, and Bob Balaban, directed by Sydney Pollack. The title refers to the legal definition of one of the requirements of proof against libel defamation, and is used in journalism classes to illustrate the conflict between disclosing damaging personal information and the public's right to know. Miami liquor wholesaler Michael Gallagher (Paul Newman), who is the son of a deceased criminal, awakes one day to find himself a front-page story in the local newspaper, indicating that he is being investigated in the disappearance and presumed murder of a local longshoremen's union official, Joey Diaz. The story was written by Miami Standard newspaper reporter Megan Carter (Sally Field), who reads it from a file, left intentionally on the desktop of federal prosecutor Elliot Rosen (Bob Balaban). As it turns out, Rosen is doing a bogus investigation and has leaked it with the purpose of squeezing Gallagher for information. Gallagher comes to the newspaper's office trying to discover the basis for the story, but Carter does not reveal her source. Gallagher's business is shut down by union officials who are now suspicious of him since he has been implicated in Diaz's murder. Local crime boss Malderone, Gallagher's uncle, has him followed, just in case he talks to the government. Teresa Perrone (Melinda Dillon), a lifelong friend of Gallagher, tells the reporter that Gallagher could not have killed Diaz because Gallagher took her out of town to get an abortion that weekend. A devout Catholic, she does not want Carter to reveal the abortion, but Carter includes it in the story anyway. When the paper comes out the next morning, Perrone picks up the copies from her neighbors' yards before they can be read. Later, offscreen, she commits suicide. The paper's editor McAdam tells Carter that Perrone has committed suicide. Carter goes to Gallagher to apologize, but an enraged Gallagher assaults her. Nevertheless, she attempts to make it up to him by revealing Rosen's role in the investigation. Gallagher hatches a plan for revenge. He arranges a secret meeting with District Attorney Quinn (Don Hood), offering to use his organized-crime contacts to give Quinn exclusive information on Diaz's murder, in exchange for the D.A. calling off the investigation and issuing a public statement clearing him. Both before his meeting with Quinn and after Quinn's public statement, Gallagher makes significant anonymous contributions to one of Quinn's political action committee backers. Gallagher, thankful for Carter's help, also begins a love affair with her. Rosen is mystified by Quinn's exoneration of Gallagher, so he places phone taps on both and begins a surveillance of their movements. He and federal agent Bob Waddell obtain evidence of Gallagher's donations to Quinn's political committee. They also find out about Gallagher and Carter's relationship. Waddell, as a friend, warns Carter about the investigation to keep her out of trouble, but she breaks the story that the office of the district attorney (D.A.) is investigating Gallagher's attempt to bribe the D.A. The story makes the front page again and causes a huge uproar over the government investigating the District Attorney. The US Assistant Attorney General Wells (Wilford Brimley) ultimately calls all of the principals together. After the truth comes out, Wells suggests Quinn resign. (Gallagher's donations to Quinn's political committee, though not illegal, cast suspicions on Quinn's motives in issuing his statement clearing Gallagher.) Wells also suspects that Gallagher set everything up, but cannot prove it, so he will not investigate further. Finally, Wells fires Rosen for malfeasance. The newspaper now prints a new story written by a different reporter revealing details of the incidents. It is unclear whether Carter keeps her job, or whether Carter's relationship with Gallagher will continue, but the final scene shows them having a cordial conversation on the wharf where Gallagher's boat is docked before he sails away and leaves the city. The movie was written by Kurt Luedtke, a former newspaper editor, and David Rayfiel (uncredited). Newman stated that the film was a "direct attack on the New York Post", which had earlier published a caption for a photo of Newman that he stated was inaccurate. Because of the dispute the Post banned Newman from its pages, even removing his name from movies in the TV listings. Absence of Malice received mostly positive reviews. Newman and Dillon's performances were praised, as was Brimley's cameo. Many reviewers compared the film to the 1976 Academy Award–winner All the President's Men. In his review, Time magazine's Richard Schickel wrote, "Absence of Malice does not invalidate All the President's Men. But with entertainment values – and a moral sense – every bit as high as that film's, it observes that there is an underside to journalistic gallantry." Similarly, Variety called it "a splendidly disturbing look at the power of sloppy reporting to inflict harm on the innocent." Rotten Tomatoes gives the film a score of 83% based on reviews from 23 critics, with an average score of 6.7/10. Absence of Malice was nominated for three Academy Awards; Best Actor in a Leading Role (Newman), Best Actress in a Supporting Role (Dillon) and Best Writing, Screenplay Written Directly for the Screen. At the 32nd Berlin International Film Festival the film won an Honourable Mention. ^ "Absence of Malice (1981)," Internet Movie Database. Accessed March 20, 2012. ^ DiGiaomo, Frank (December 2004). "The Gossip Behind the Gossip". Vanity Fair. Archived from the original on September 29, 2011. Retrieved September 13, 2011. ^ Schickel, Richard. "Cinema: Lethal Leaks", Time magazine (November 23, 1981). ^ Variety Staff. "Absence of Malice", Variety (December 31, 1980). ^ Ebert, Roger. "Absence of Malice", Chicago Sun-Times (January 1, 1981). ^ Kehr, Dave. "Absence of Malice", Chicago Reader. Accessed March 20, 2012. ^ Kael, Pauline (2011) . 5001 Nights at the Movies. Henry Holt and Company. ISBN 978-1-250-03357-4. ^ "Absence of Malice (1981)". Rotten Tomatoes. Retrieved March 20, 2012. ^ "Berlinale 1982: Prize Winners". berlinale.de. Retrieved September 2, 2010.